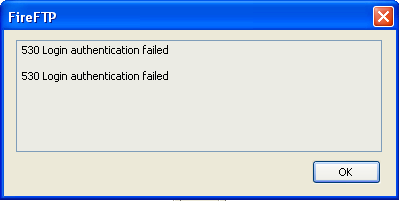 Yesterday while trying to access my web hosting account, I received an error message "503 Login Authentication Failed". I have been using FireFTP as my FTP client for one year and I never faced such an issue. I had been using FileZilla before migrating to FireFTP but it never showed such a problem. However, I do not believe it is an issue with FireFTP. I have checked the username, password and host address once again but they are correct. I tried to log in to web host account a few more times but received the same error. One time it showed a different alert with the same code. The new popup was "503 Login error". This tutorial explains the reasons and solution of "503 Login Authentication Failed". Since I was in a hurry, I couldn't troubleshoot the issue by myself. I deleted the entire FTP cache and entered the FTP server access details manually once again. This time I didn't face any trouble to access the web server. I have saved the screenshot of the popup I received. Today morning I started searching for more about this message. In many discussion forums, experts say "503 Login Authentication Failed" is due to the incorrect username or password. You may get the alert if the host address is typed wrongly. Another possibility is the usage of Caps Lock without knowing that key is on while entering username and password. Anyway, after clearing the cache of my FTP program (deleted previously saved username, password and host address), I successfully logged in to my server ftp account. The reason for 503 Login Authentication Failed: An FTP error occurred - cannot make connection to host is the incorrect File Transfer Protocol login information. Port Number should be 21 (FTP server use port number 21 to transfer files). PS: Clearing cache means delete all stored FireFTP usernames, passwords, and host addresses. This procedure cannot be undone, so make sure you have the backup of the necessary details you entered. How to delete ftp cache? by simply using delete button we can delete selected ftp username and details from ftp cache..